Dogs originally bought from pet stores are more likely to be aggressive to their owner compared to those from responsible breeders, even after owner-related factors are taken into account. Research by Frank McMillan et al (2013) found that dogs obtained as puppies from pet stores are more likely to have a whole range of behaviour problems than those from responsible breeders, including 3x more likely to be aggressive towards their owner. Pet store puppies come from commercial breeding establishments, otherwise known as puppy mills, which are run for profit and not animal welfare. Since well-informed people are less likely to go to pet stores, one potential confound is that the owners of pet store puppies may know less about how to raise a dog. A new study by Federica Pirrone et al (2016) takes owner factors into consideration too. The results show 21% of the dogs that were obtained as puppies from pet stores were aggressive towards their owner compared to 10% of those obtained from breeders. Owner-related factors did not account for this. Three other behaviour problems – house soiling, body licking, and separation-related distress – were also more common in dogs obtained from pet stores, but it turned out these were linked to owner-related factors. These included only taking the dog for short daily walks (20 minutes or less), not going to dog training classes, not having owned a dog before, not knowing about the existence of veterinary behaviourists, and punishing the dog when returning home. Most puppies sold in pet stores in Italy, where the study took place, come from commercial breeding establishments (puppy mills) in Eastern Europe, where conditions can be extremely poor (“filthy conditions with little food or water” is how the Daily Mail described one Polish puppy farm). The responsible breeders from whom puppies in the study were obtained are members of the Italian Kennel Club and follow a code of ethics that includes providing socialization opportunities that are essential for puppies. The scientists suggest several possible reasons for increased aggression in dogs that originate in puppy mills: epigenetic factors due to the mother being stressed in pregnancy, lack of socialization, the stress of the early environment and its negative influence on learning ability, and a lack of information provided by pet stores to new owners. The study included 349 dogs that were acquired from breeders as puppies and 173 dogs that were bought as puppies from pet stores. They were all over 1 year old at the time of the study. No effect of breed or breed group was found. It’s worth noting the list of potential behaviour problems relied on owner report, and was not based on any official diagnoses. Owner-directed aggression did not include food guarding or toy guarding, which were separate questions and were not linked to origin of the puppy. Stranger aversion was also a separate question and not linked to origin either, which ties in with research by Casey et al (2014) that found aggression towards family members is typically not linked to aggression to strangers. This study shows that puppies from puppy mills are more likely to be aggressive to their owner as adult dogs, regardless of various things the owner might or might not do. It also shows that a range of owner-related factors are linked to other behaviour problems. This is useful information for educational campaigns, which are important because there is a lot of erroneous information about dog training. Other research also suggests it is important to attend a good puppy class. Good advice for people intending to get a dog is to make sure not to get a puppy from a pet store, sign up for good dog training classes, and make sure the dog gets enough walks as this is important for ongoing socialization as well as exercise. And, of course, learn as much as you can about how to take good care of and train your dog. 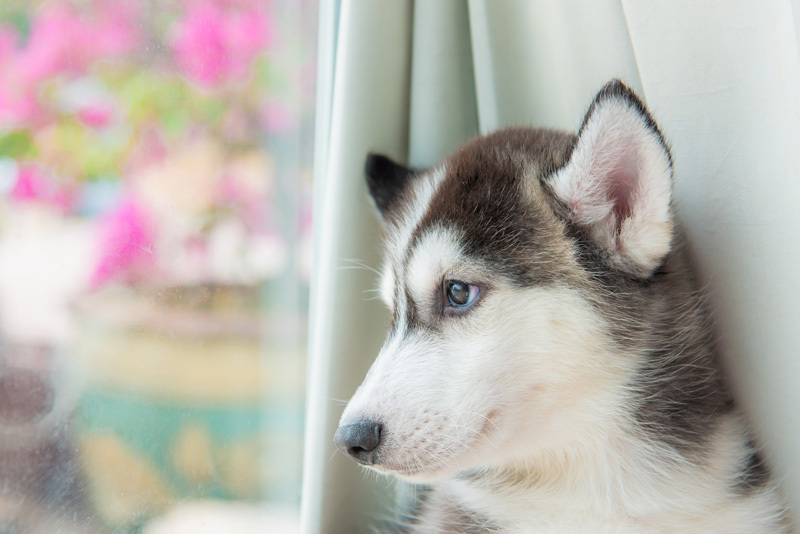 You might also be interested in this subsequent review of the literature that looks at the potential causes of behaviour problems in pet store puppies. P.S. 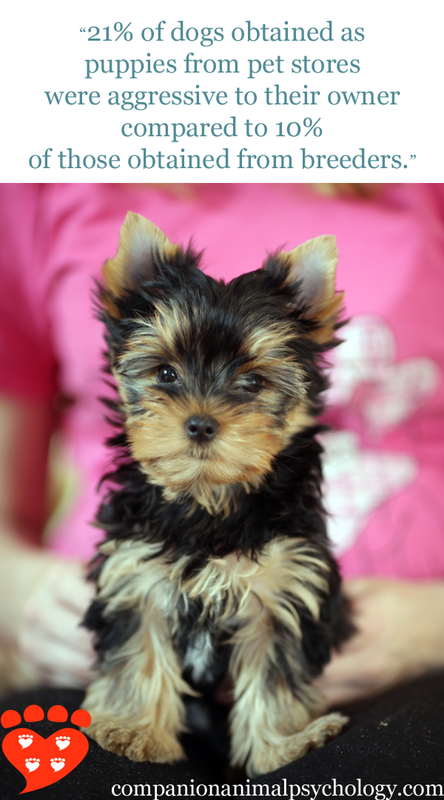 How to choose a puppy in 4 easy steps and why you need to socialize your puppy. I made the mistake of purchasing a puppy from a pet store over the summer. I've always been against puppies in pet stores but I saw him & it was an impulse buy. He's going on 6 months now & he is a holy terror. Not aggressive but the worst behaved puppy I've ever seen. He's been to two puppy classes (got kicked out of the first one) & a local place that does doggy daycare refused to let him go there. I'm at the end of my rope & honestly don't know what to do. I've considered re-homing him but I don't want to do that. I made a decision to give him a forever home but I'm about to give up.